Connie Hedegaard, the European Union Climate Action Commissioner, said legally binding commitments should be the core of the new international legal framework to address climate change. She thus insisted that all countries, including India should agree, for this agenda. She was speaking at a conference organised in Delhi last week by the Centre for Policy Research, a New Delhi-based think-tank, to discuss the prospects of the new climate agreement to be clinched in Paris next year. The panellists at the conference comprised Joanne Scott, professor of European Law, University College London, Hedegaard, and Jairam Ramesh, former environment minister during UPA regime. Both the European panellists expressed satisfaction with the European Union’s “unilateral” efforts to address climate change, which includes 40 per cent reduction targets by 2030, a market mechanism called European Union Emissions Trading Scheme (ETS), and also numerous climate-related legislation. Hedegaard and Scott, however, also said targets and efforts of the EU, though significant, may not be ambitious enough considering the 2°C limit for containing global warming. Problems with ETS and the role of opposition parties were also highlighted. 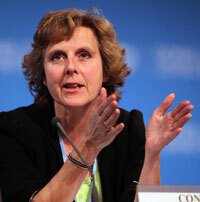 Hedegaard pointed to the major problem that the EU faces—lack of consensus among its 28 member states. “The EU is a vast and heterogenous group of countries. Forging consensus does not happen every time.” She also highlighted that the EU’s experience has been that effort sharing works better when the commitments are binding among member states. This, according to her, is the “EU culture and also colours its international position on climate change”. Ramesh, however, held a different view. He agreed that urgent measures are needed to address climate change and also pointed out that India is sincerely working in this direction. He cited various energy efficiency norms which have been identified and also a fully functional energy efficiency market which would be in place by 2015. But he advocated “an incremental and pragmatic approach to climate change”. According to him, binding commitments cannot work for many countries, including India, because of their economic needs. He was of the opinion that binding commitments should be left to national legislatures. He reiterated “pledge and review” system, under which pledges made by countries would first be subjected to national and then international review. “To prove credibility internationally, demonstrate strong climate change actions domestically,” he said. “Top down quantitative approach mechanism in setting targets and making them binding is not saleable,” he said. He also pointed out that “foreign policy objectives, economic objectives and environmental objectives” cannot all be achieved at the same time. Given the option, in a country like India, “economic objectives will always take over environmental objectives,” he said.